At 9 years old, Kayla Upthegrove received her first saxophone. She immediately joined her parents, who are also musicians, in their basement to play. “I was just playing random notes, just having a ball making noises come out of this instrument,” said Upthegrove. Little did they know that Upthegrove would grow up to be one of the first Black female professional saxophonists to come out of Cincinnati. Now, she is winding up her final semester in the jazz studies program here at NKU. It was in her senior year of high school that she knew she wanted to play saxophone for a living. That passion grew as her career in music accelerated. “Being around a bunch of people who were better than me, seeing what people can accomplish while being a musician, the rush of playing music in front of people, getting that applause and all the attention—it made me feel really good,” Upthegrove said. For her, inspiration could be found in various people. Of course, she felt inspired by jazz greats like, Dexter Gordon, Charlie Parker and John Coltrane, but a bulk of her inspiration grew from her relationship with her boyfriend Eric Snyder. “He pushes me so hard and he is such a good musician himself that I want to be able to be where he is—and he believes in me which is huge,” said Upthegrove. Another source of inspiration has been the professor who encouraged her to come to this university in the first place, associate professor and jazz studies coordinator William Brian Hogg. Upthegrove hopes to be a role model for young people dreaming of being a musician. “All of the other schools that I auditioned at didn’t seem to believe in me—that I could become a great saxophone player. He was the only one that was like, ‘I think you have something here, and I think we can make it better,’” Upthegrove said. Hogg said when he first met Upthegrove she just had “that thing”—that drive to be great. Hogg said Upthegrove has grown a lot since she first came to NKU. Her colleague and friend, Charlie Suits, jazz studies and audio production double major, knows this side of Upthegrove very well. Hogg says Upthegrove has overcome many obstacles in this journey. In a male-dominated music scene, Upthegrove hopes to be a role model for young people dreaming of being a musician. Hogg knows firsthand that it takes guts for a young person to embark on a professional career in music, but for Upthegrove to face the obstacles of being an African-American woman on top of all those things is incredible. “Music is suffering because we have less and less influence of women,” said Hogg. Upthegrove’s message to young women who aspire to play music is to work hard and try to stay positive. 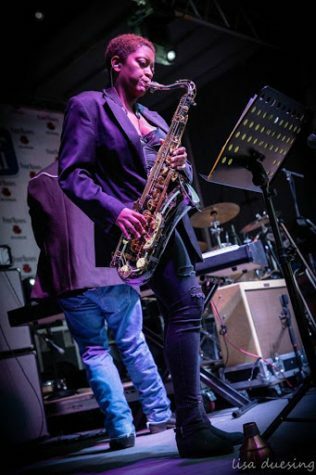 “Even though there are not a lot of women in the jazz scene to look up to—even if you’re looking up to the male musicians, just think that maybe one day you will be that female musician for younger people can look up to,” said Upthegrove.